Soak boiled rice,urad dhal,channa dal overnight & Grind well and allow to ferment for 8 - 10 hours. Heat oil in Dawa, use one laddle of batter & Make pancake.Leave it to cook & turn to cook on otherside until crisp. serve hot with sambar & chutneys. wht a wondeful breakfast...wish i had those plate daily...its hevently.. I always get hungry when I see a dosa! Makes me wish I had a teensie bit more talent with making them! wow this looks yummy. This channa dhall dosai is really new to me. will try it soon. Looks great! Bet it tastes just as good. We normally make "Adai" with a few lentils, but never made it just with Channa dal. Will try it next time. 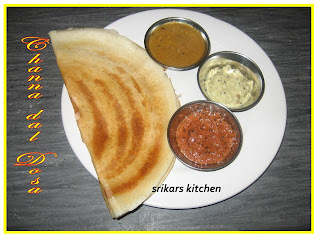 Dosa with the twist..this is gud..going to try this sometime..
Hi, I am back :)) Dosa looks perfect, and delicious!! !